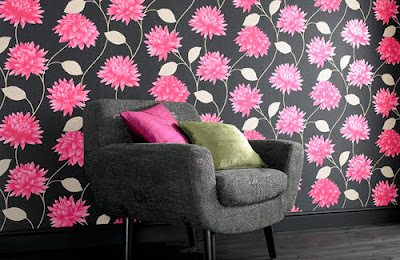 Cut enough lengths of paper to complete the first wall, allowing 100mm for trimming, or more if your wallpaper has a large pattern or design. Push a length of the paper into a top corner of the room and mark the wall about 25mm in from the free edge. Hold the plumb line at ceiling height so that it passes through the pencil mark and make several more marks along the line. Join the marks up with the ruler or batten. Paste the first sheet by spreading some paste into the centre and working the brush in a herringbone pattern to spread the paste to the edges. A good technique is to hold the paper against the table edge furthest from you and paste up to this edge first. Then pull the paper towards you and paste the nearest edge. Fold the pasted sides inwards so that no paste touches the face side. Hang the folded paper over a broom between two chairs. Apply paste to two or three more pieces of paper to allow the paper to absorb some of the paste and become more pliable before you hang it. Hang the next length in the same way, butting the edge neatly against the first piece. Make sure the edges are firmly glued down by running a seam roller along the joint. Always sponge off any excess paste with a clean wet sponge or it will dry as a shiny patch. Turn off the electrical supply before papering around sockets and switches. Remove the cover plates and hang the paper as normal, trim to size and then re-fit the plates. Be sure that all the rolls you buy have the same batch number as colour may vary slightly from batch to batch. Use bulldog clips to hold the paper on the table as you paste it. Make a small cross with a craft knife in the centre of any air bubbles under the dry paper. Brush some paste on the underside of the flaps and press down with a roller. Don't mix old and new paste. Mix up enough to cover one wall at a time. Put half a matchstick into the ends of wall plugs so that you can see where to replace hooks and screws.